Take a stroll down Armenia street in Beirut’s Mar Mikhaël neighbourhood, a bohemian area replete with cafés and street bars, and before long you’ll pass a telling sight. Common here, as elsewhere in the Lebanese capital, are the kind of arches that in the franco-levantine amalgam comprising most of the city’s pre-civil war architecture would usually lead into a building or courtyard, only every now and then one opens instead onto a void, piled with sun-bleached rubble and robust flora. These hollowed out spaces tell the story not just of the catastrophic destruction of what was – for its elegance and colonial past – once considered the “Paris of the Middle-East,” but of attempts to reconstruct the metropolis, with developers often maintaining the façades of buildings whilst abandoning the traditional, socially focused floor planning of local vernacular architecture. Moving west, an exhibition of new work by Nathaniel Rackowe (b. 1975) at Letitia Gallery examines the changing nature of the built environment, reflecting on the life cycles of urban dwellings by combining industrial materials with illuminations. Rackowe is, amongst other things, an urban-abstractionist, the kind who distils impressions of a city into his practice. And as certain parts of the MENA region rapidly develop, these types of artistic responses are growing to be more popular; Letitia’s decision to invite an artist using the textures of the landscape is au courant. For instance, In the Beirut Block series – which fills the gallery’s central space – six separate works comprise cement blocks of different shapes. Collected whilst driving around the city with gallery co-founder Annie Vartivarian, the pieces are contained within cubic frames of white neon that soften their appearance and alter their respective forms. 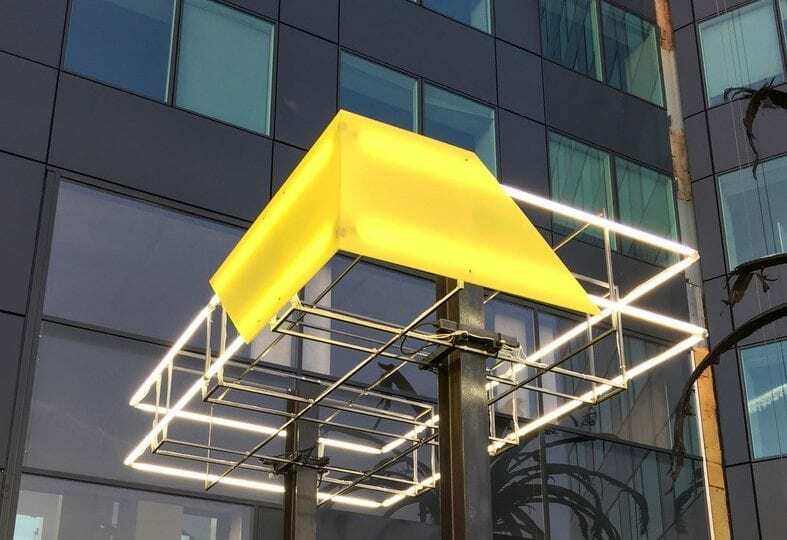 The pieces are sculptural simplifications of an everyday urban experience, considering the ways in which artificial light plays with our perspective of objects as we move through cities, from neighbourhood to neighbourhood, and from morning to night. However, a more compelling and perhaps unintended aspect of the collection is how the platforms of Perspex blocks refract light and allow an insight into the insides of structures where the glow fails to reach. If Rackowe’s intention is to discover the shape of a city – whether visible or invisible – this furtive reflection of the hollow spaces hiding in Beirut’s unfinished building projects and rubble-strewn courtyards is felicitous. 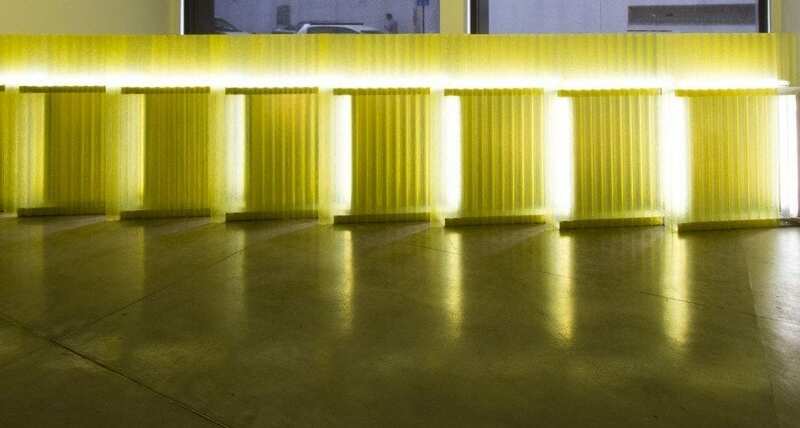 In another central sculpture, LP48, which stretches across and bisects the gallery like a fence, parallel sheets of corrugated yellow plastic overlap and encase metal frames bearing white neon tubes. Passing the work whilst entering the main gallery, viewers can see between the two sheets, evoking a hollow interior similar to that in the Beirut Blocks. In a more direct reference to the urban areas around Letitia, a collection of paintings is entitled PSC, standing for “Petrol Station Canopy.” In each of these, Rackowe reduces the eponymous structure found in one such station just up the road and flattens it into a number of subtle variations on a theme, each comprising planes of black, white and the artist’s signature fluorescent yellow. Elsewhere, in a small room toward the back of the space, a small selection from the FG series – comprising neon tubes suspended in front of overlapping panes of vacuum coated or smoked glass – evokes the tall glass towers that increasingly dominate the skyline of downtown Beirut. In addition to the exhibition, two of the artist’s creations are placed within the city as public artworks. On a square in the vicinity of both a local mosque and Zaha Hadid’s as yet unfinished building for the Beirut Souks is an iteration of Black Shed Expanded (2017). One of Rackowe’s best-known pieces, a garden shed, – aid on one part of its roof – appears to explode at the joints, revealing a cluster of lights and bright yellow inner walls. Nathaniel Rackowe: The Shape of the City is at Letitia Beirut until 25 August. For more information, click here. 1. Nathaniel Rackowe, Black Shed Expanded, 2016. Timber shed, fluorescent lights and fittings, bitumen, paint, steel. 240 x 220 x 220 cm. Sculpture by the Sea, Perth, 2016. Image courtesy of the artist. 2. Nathaniel Rackowe, LP48 2018. Corrugated GRP roofing sheets, galvanised steel, fluorescent light, electronics. 120 x 30 x 700 cm (as exhibited). 3. Nathanial Rackowe, PSC 2018.